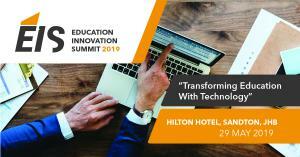 JOHANNESBURG, GAUTENG, SOUTH AFRICA, April 10, 2019 /EINPresswire.com/ -- Johannesburg: The 4th annual Education Innovation Summit is set to take place on the 29th of May 2019 at the Hilton, Sandton, Johannesburg. Hosted by IT News Africa, the summit is designed to bring together innovation leaders and the academic community by facilitating and accelerating innovative thinking in education. The summit will explore the need for academic institutions to adapt and embrace technological changes in order to drive innovation within the education sector and subsequently tackling the digital revolution head on. Under the theme “Preparing Africa for a Tech-Driven Future” the Education Innovation Summit 2019 aims to create opportunities for meaningful and valuable discourse through interactive roundtable discussions and case studies from top academics, technology leaders, education regulators and EduTech entrepreneurs- all sharing their expertise and experiences with emerging technologies in the education sector. 1. Radically re-think the role of technology in Education. 2. Prepare your educational institution for digital transformation. 3. Collaborate with private sector players in advancing innovation in education. 4. Keep up with technology trends to improve the quality of teaching and learning. 5. Meet and interact with senior stakeholders and key decision makers in Education. 6. Learn how to prepare your students for the workplace of tomorrow.